Wednesday Wisdom: Be careful driving during bad weather. When it's dark outside, depth perception, color recognition and peripheral vision are compromised. 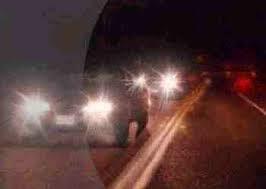 And the glare of headlights from an oncoming vehicle can literally blind a driver temporarily. Even with high-beam headlights on, visibility is limited to about 500 feet (250 feet for normal headlights) creating less time to react to something in the road – especially when driving at higher speeds. What should you do to combat darkness? Aim your headlights correctly, and make sure they're clean Dim your dashboard Look away from oncoming lights If you wear glasses, make sure they're anti-reflective Clean the windshield to eliminate streaks Slow down to compensate for limited visibility and reduced stopping time.